On April 21, 2007, the Coastal Sales Center, one of the leading call centers in Tempe, AZ, launched it's own in-house entry level travel membership program to offer business opportunity seekers and travel club enthusiasts the advantage of making more money and traveling for less. The call center is the #1 seller of Coastal Vacations Club memberships in the world. It is a 100% completely customized program, built from the ground up, with simple usability features that make budget savvy travelers and people seeking low cost business opportunities very happy. It also uses the most cost effective money saving travel vendors available, with high rankings in satisfaction surveys in the ever popular $7 trillion dollar travel niche. Fans of the highly successful, Coastal Sales Center, which markets the world's #1 travel memberships for Coastal Vacations Club members, just created an entry level program for people who feel the Level One price point is too steep for their pocket book. 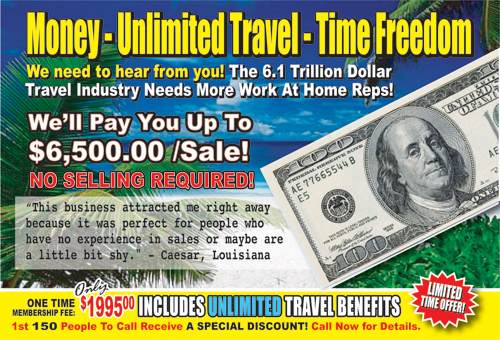 "The idea of creating this product was because so many of our prospects could not afford our Coastal Vacation Travel Club memberships at $1995, so instead of turning them away and burning valuable advertising dollars and wasting leads, we now have an option that any business opportunity seeker or budget minded travel club seeker could easily afford," said Jeff Mills, CEO of Goldmills Marketing, which is one of the top firms marketing the Coastal Vacation Travel Club Memberships. The Entry Level Product contains 4 travel bargains, which can all be activated online, without having to spend extra time, sending flyers in the mail, or running to the bank getting money orders. Unlike most travel clubs, there are few blackout dates and no silly timeshare tour requirements with all the Entry Level vendors. Unlimited 8 Day/7 Night accommodations at over 3500 Condos & Villas Internationally! Complementary Caribbean Cruise for Two! Each trip does have a clearly spelled out terms and conditions sheet, so each traveler knows the conditions for their trip, before they book it. That way, they claim there are no surprises. "For people who enjoy global resorts around the world, we are giving them a serious offer that will meet their needs. We want our members back who left Coastal Vacations because we believe this Entry Level Product is a far superior product to many other global travel and resort networks out there, plus will see people make more money who could never sell the higher priced Coastal product." Each of the 4 travel offers allow for easy activation with a credit card, which allows for easy fulfillment, rather than sending money orders and bank checks in the mail and having to endure massive shipping back-ups, or worse... "lost in the mail orders" which can plague traditional travel club users who are familiar with the Coastal Vacations Club fulfillment system. "The Entry Level Product must not be confused with Coastal Vacation Club, because it is not Coastal" stated Mills. "It is a 100% completely customized program, built from the ground up, with simple usability features that make budget savvy travelers and people seeking low cost business opportunities very happy. It also uses the most cost effective money saving travel vendors available, with high rankings in satisfaction surveys in the ever popular $7 trillion dollar travel niche." This makes the Sales Center a very attractive business partner for busy entrepreneurs who know how to leverage the skills of professionals, to allow them to do the hardwork for them. It is a known fact that most people hate selling and don't know how to ask for the money and close their own deals. Anyone currently in Coastal Vacations, can use the sales center to help them close their leads, and are encouraged to call the center up to inquire about their options for having the sales center close both the Entry Level Memberships and also their Coastal Vacations Club sales, which provides time savings and leverage for all Coastal Vacation Directors and Associates. As a member of the Entry Level Membership, that member will make commissions of $300 if the call center sells an Entry Level program or any of the 3 levels of the Coastal Vacations Club membership as well. The costs getting started, having a call center close your sales is only a one time $795, as opposed to the $1995 which is required to only sell Coastal Vacations Club through the Sales Center. All the details are best to be understood by calling the Coastal Sales Center Account Reps at 1-800-378-1169 with ID 2189JM. "Coastal Vacations Club is still the top dog," said Mills, "It's been around for over 12 years, and definitely has the best value and commissions for sales reps, but with our new Entry Level position, sold 100% exclusively, through the Coastal Sales Center, more members will be able to make more money and that is what we want to see happen: happy clients, making great commissions, while our sales center does all the closing for them. The plan is that over time, people will be able to leverage themselves into the Coastal program, once they earn the commissions from the Entry Level one, and I am confident, many will do that with this new system. We are number 1 for a reason, and it's because our simple system really does help our members make money, without having to do all the work themselves." For current members in Coastal Vacations, one can call the Sales Center for more info on how to get started in either program. Or, visit the Coastal Sales Center website for more information, and click on Vacation Products on the menu, after the squeeze page. Coastal Sales Center Level 1 MembershipPreview for more exciting detailsa about the Coastal Sales Center. Coastal Vacations Travel Club DetailsDownload a free detailed report on what is in the Coastal Vacations Memberships Coastal Call Center DetailsHow does the Coastal Call Center work? Do You Have an Online BusinessThe Coastal Sales Center Closes the Sales for you. 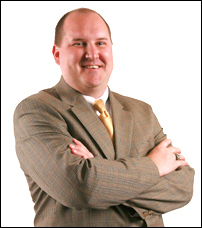 Jeff MillsJoin Jeff Mills' team with the Coastal Sales Center. Jeff is a #1 Money Earner! 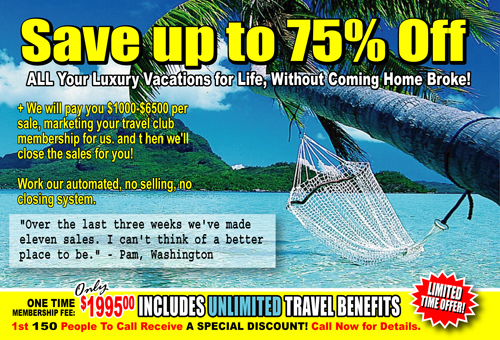 Coastal Vacations Cash CowIs your coastal vacations club busuiness a cash cow?